Hope is a dangerous drug. Such an inflation of reality leaves the danger of utter despair when the bubble finally pops. Oblivious to these perils are NBA franchises. They are slanging hope like dope to the eager masses, eager to sell the promise of a better tomorrow over the bleak reality of the present. Potential is now the marching cry of the masses, and I must admit it is easy to fall right in line. Enter the Summer League. Aaron Gordon was an unstoppable force of nature. He ran the court like a gazelle, pounced on ball handlers like a lion, flew to the rim like a hawk, bullied the boards like a Rhino and shot midrange jumpers like, well, a Durantula. He looked like a hybrid of Carmelo Anthony and Shawn Marion, able to jab step defenders to death in the midrange and while wrecking havoc on defense and the glass. He was the Melo-trix. Gordon finished the game scoring 22 points, snaring 18 rebounds (5 offensive) and adding 2 rejections, looking very much like the franchise centerpiece the Orlando Magic imagined when they drafted him 4th in the 2014 draft. 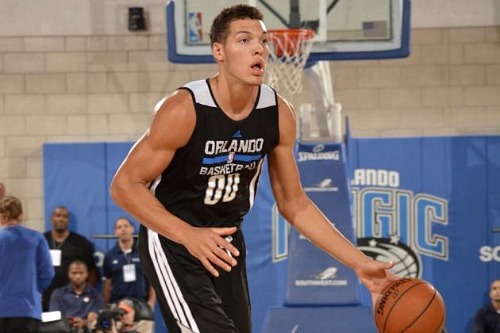 Aaron Gordon looked like a force to be reckoned with in the summer league opener. The NBA Summer League is all kinds of fun. For hoops junkies, it is a welcome reprieve from the unending monotony monopoly the MLB has over the summer. It is a chance to finally see in action some NBA prospects that have been simultaneously hyped and broken down in great detail in the months leading up to the draft. A chance to support sneaking suspicions that a player is a bust or affirm unexplained optimism that he is a diamond in the rough. A chance to see if the 20 pounds of muscle he gained since last season will help him finish in traffic or the 20 pounds of fat he lost will help him be quicker with the ball. A chance to see if he really did add the corner three or will shoot 80% on his free throws. A chance to believe in a chance. Emmanuel Mudiay is the future of the point guard position. He appeared to be playing the game running downhill, a man amongst boys, slicing his way to the rim with ease. He has the strength to power through any hapless defender in his path, the finesse to cross them over, and the skill to hit pull-up jumpers. He played like a mix of John Wall and Chris Paul, using his gigantic frame and otherworldly athleticism to get into the paint, while still displaying the patience and intelligence to make the right play. Mudiay finished the game with 19 effortless points, 10 delicious dimes and 3 swipes. If the plan is to rebuild in Denver, the Nuggets have their foundation in Mudiay. 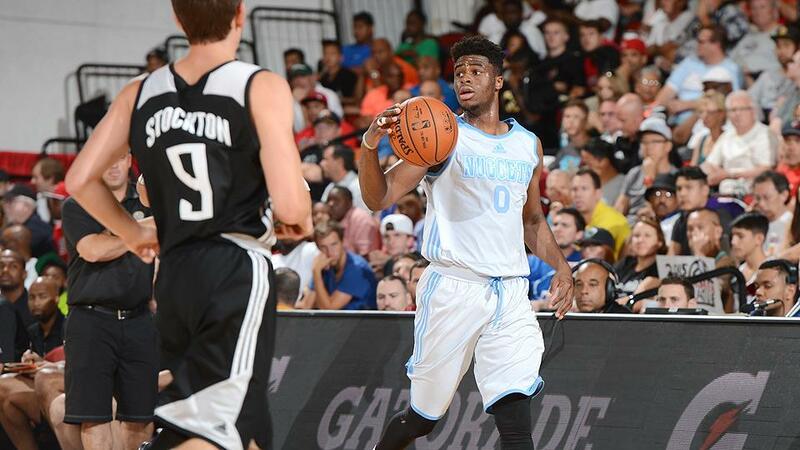 Emmanuel Mudiay looked like a man amongst boys in the Las Vegas Summer League. The danger of the Summer League is more often then not any conclusions are a desert mirage, enticing at first glance but ultimately the oasis only appeared because you were staring too intently. Even though a player looks like a superstar, it is always important to note the context. Las Vegas is littered with the carcasses of false prophets, performances that offered a glimmer of hope only for reality to quickly snuff that ambition out. Jeremy Lamb lit it up in the summer league. Anthony Randolph looked like a superstar. Marco Belinelli was getting double teamed. Hope is by no means a bad thing. It is a great way to get fans through a rough season. However, just remember to take the Summer League with a grain of salt. Look for the splashes of elite skill sets and the hints of the player they will become. Aaron Gordon may in fact become a hyperactive defender with a solid midrange jumper. Emmanuel Mudiay could be the future of the point guard position. Just don’t expect their dominance to be anything more than a nice way to get your hoops and hope fix for the day.